It’s no secret to anybody who knows me that I love Disneyland. It is my happiest place. I love that the second I enter through the tunnel, I no longer feel like a 34 year old; I feel like a 7 year old. 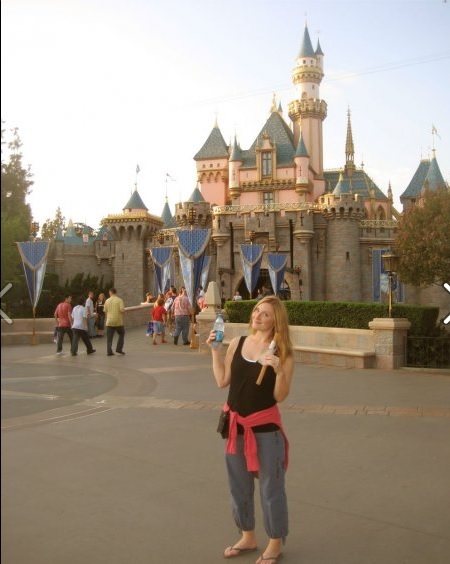 Well, now I have three kids, so maybe I’ve aged to like 12 in Disneyland years. Either way, when I walk onto Main Street, and I hear that band music playing The Old Timers Waltz Medley, and I smell the smells of the bakery and the ice cream shop, and I see the candle lit in the window of Walt’s apartment, I AM HOME. I’m one of those 34 year olds who sees Goofy walking down Main Street and gets just as excited as the kids “Oh my God, it’s GOOFY!! !” and to me, it really is Goofy. My poor, poor husband’s eyes are bound to eventually get stuck in permanent rolling position. Anyway, the second indisputable fact about me, is that the first thing I’m going to eat in Disneyland is going to be a churro. And that I’m going to eat at least one every single day I am there. Some days I will eat two, and I when I made the mistake of going to Disneyland when I was pregnant with my daughter, I may have even had three one day. I’d prefer not to say if that is a true story or not. Anywho, I digress. My husband enjoys them too, despite his grumblings about the “eleven dollar churros” (read: $3.75) and he eats his fair share of them too. At Disneyland, I think the average person walks like 22 miles a day or something, so I don’t even feel guilty about it. 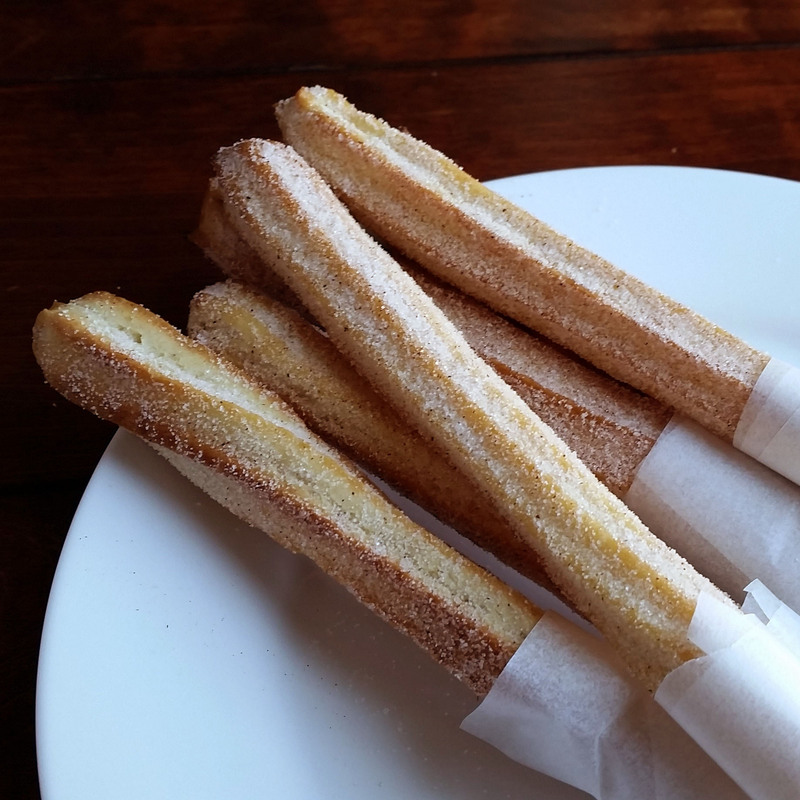 At home, however, is a different story, and that’s where these churros come in. I saw this recipe for Baked Churros on HGTV and I knew I had to try them ASAP. 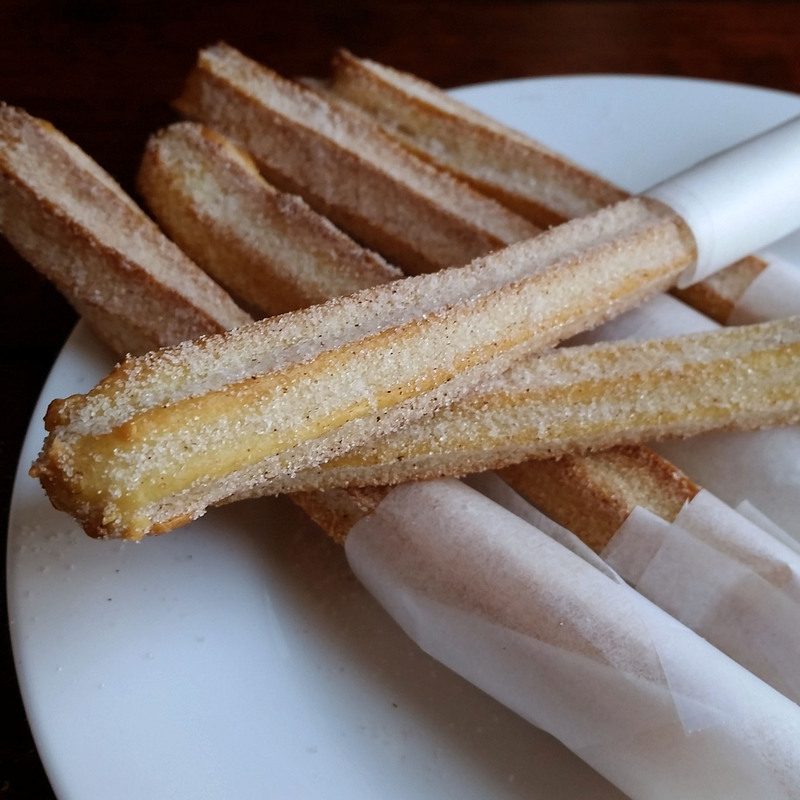 Now, I knew going in that it wasn’t going to taste exactly the same as a deep fried churro with the gooey dough inside, but I have to tell you, these exceeded my expectations. They still had that crispy coating and that soft inside, and the cinnamon sugar stuck right to them. They were delicious. My kids ate two each and then continued to ask for more long after they were gone. Another benefit was that baking them instead of frying them was easy, simple, and practically mess free. Now, a 5 year old and a 3 year old walking around your house eating a baked good dipped in cinnamon/sugar: not mess free. Have them eat these outside, or at least sitting at the table. Give these babies a try, you will not be disappointed. 1. Preheat oven to 425 degrees F. Cover two baking sheets with parchment paper; set aside. In a medium saucepan, stir together 1 cup water, brown sugar and salt. Add butter and place over medium-high heat. Heat until butter is melted and mixture starts to boil. Remove from heat and add flour, stirring with a wooden spoon. Mixture will clump and pull away from the sides of the pan. Mix and mash with a wooden spoon until no streaks of flour can be seen. 2. In a small bowl, combine eggs and vanilla. Scramble mixture with a fork and then add to the dough ball in the saucepan. Stir and mash, breaking up the dough until loosened. Stir well until eggs are incorporated and mixture has the appearance of mashed potatoes. 3. Transfer dough to a piping bag fitted with Ateco decorator tip #867. (I used a Wilton Decorator Tip #1M Open Star) You could also pipe the dough in a zip-top bag with the corner snipped to make churros with no ridges. 4. Pipe dough into long, thin lengths on the parchment-covered pans. Use a pair of kitchen scissors to cut the end of the dough from the piping tip. 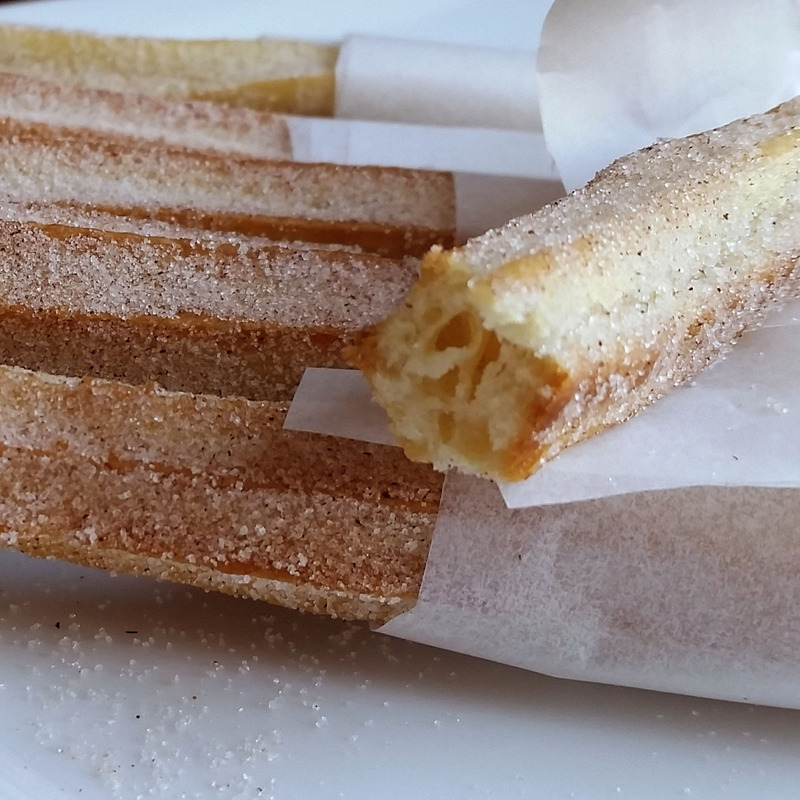 Leave about 2 inches of space between the churros. 5. Bake for 10-12 minutes or until slightly puffed. Turn oven to broiler setting and watch carefully as churros toast and turn deep golden brown. Remove from oven and let cool slightly. Transfer to a wire cooling rack. 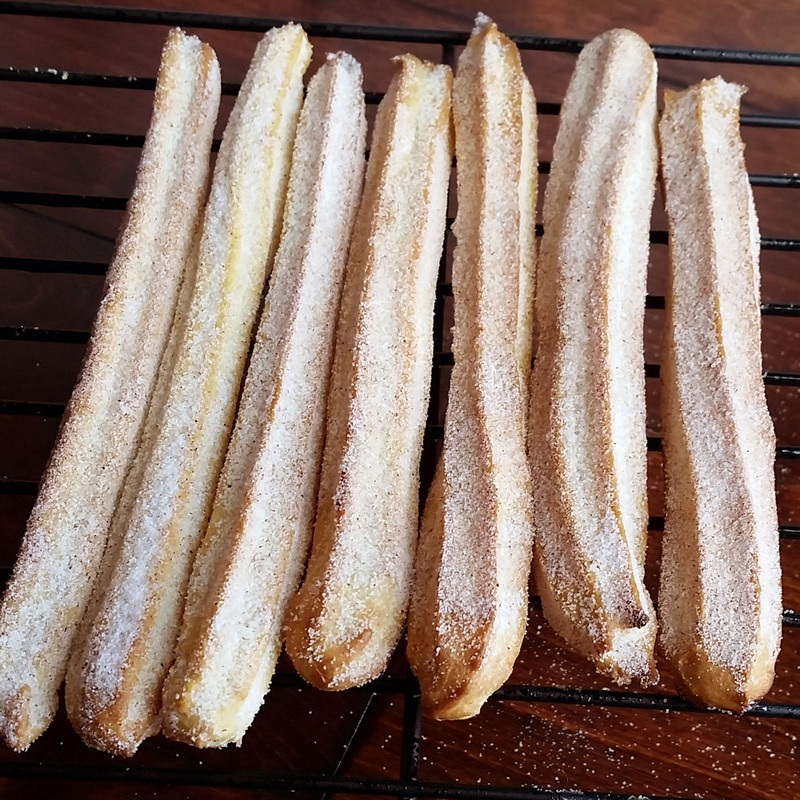 If you’re baking the churros one pan at a time, be sure to return the oven setting to 425 degrees F before putting in the next pan. 6. Combine sugar and cinnamon and pour onto a long dish (Image 2). Roll churros in mixture. Serve. Disneyland is the best! 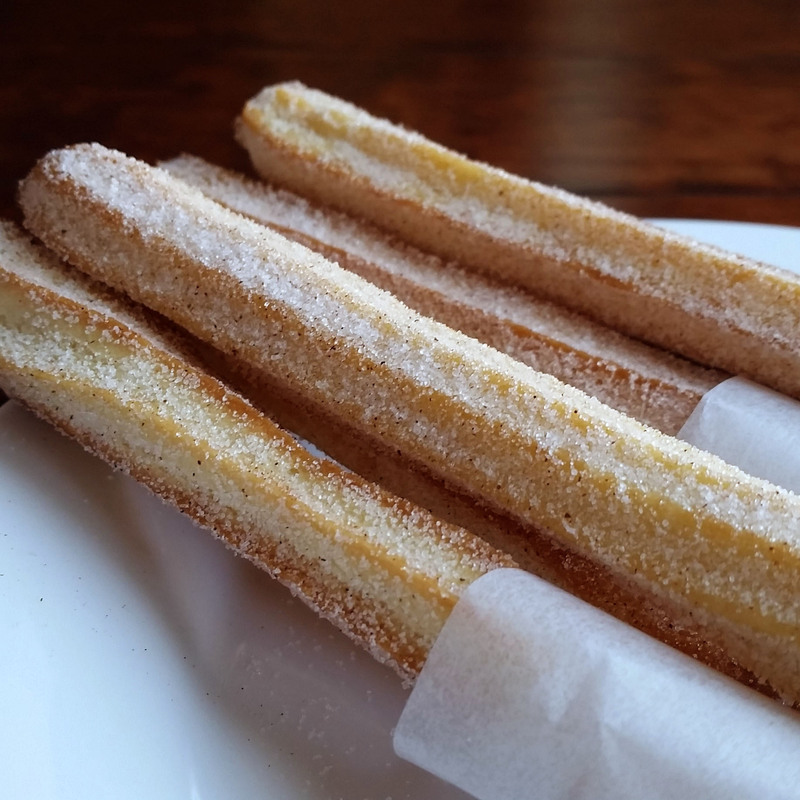 I love the feeling of being a kid again living in a world where all magic is possible =) My boyfriend rolls his eyes as well when I tell him I want to go there but I know deep down he loves it too 😉 And… I love churros, soo yummy! Especially covered in chocolate! I will have to try your recipe out, sounds perfect! so happy to have found your blog! Disneyland is my happy place and now I just wanna go back! 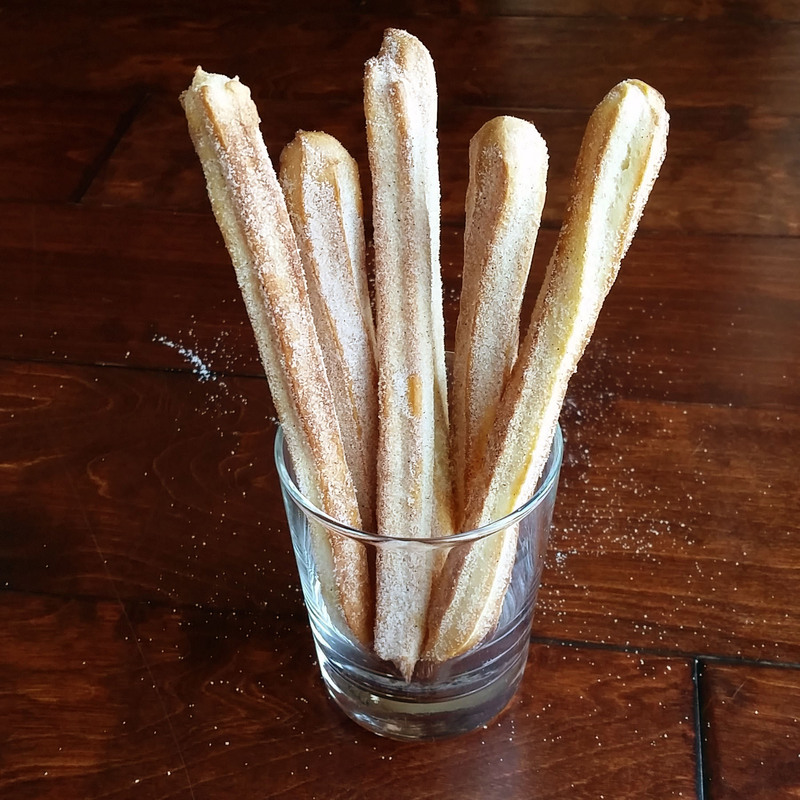 Loving the idea of a healthier churros, too. Thank you! Disneyland is the BEST! hi Shannon, I tried the recipe but the outside is not crispy. The colour is already brown, so I don’t think they are underbaked. Do you have any idea what I might have done wrong? Thank you. PS: I hate the mess from frying too! Hi Penny, they definitely don’t get quite as crispy as a fried churro, but they shouldn’t be soft. My oven might run a tad hotter than yours. Maybe bump the temp up a little bit?